Almost well known e-stores today have powerful drop down carts swiftly revealing the added-to cart products in an excellent dropdown list appearance. Ajax Dropdown Cart makes ecommerce websites look tidy as well as competent, giving customer’s pleasures when reviewing products that they have chosen in shopping activities. Ajax Dropdown Cart Virtuemart extension is easy for you to set up like a regular Joomla installation. After you activate the module and include it at any chosen position in the Joomla template (top/header is recommended), then it will be ready to use the dropdown cart. Instantly add products to cart without reloading the cart page. 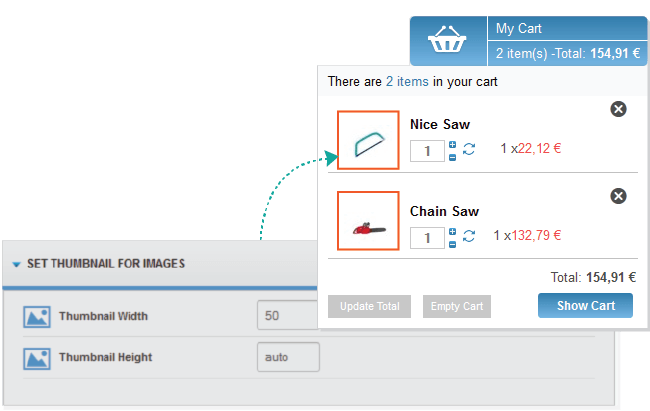 With this extension, your customer can add products into the cart without reloading the page. Cart's content can be expandable with effects. Update products without loading pages. Remove any product on the cart page. 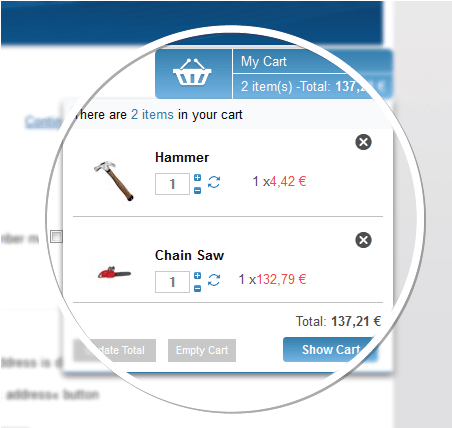 Your customer can remove any product from the drop-down cart, also they can empty cart by just one click. When your customer update/delete an image to indicate loading process will appear. 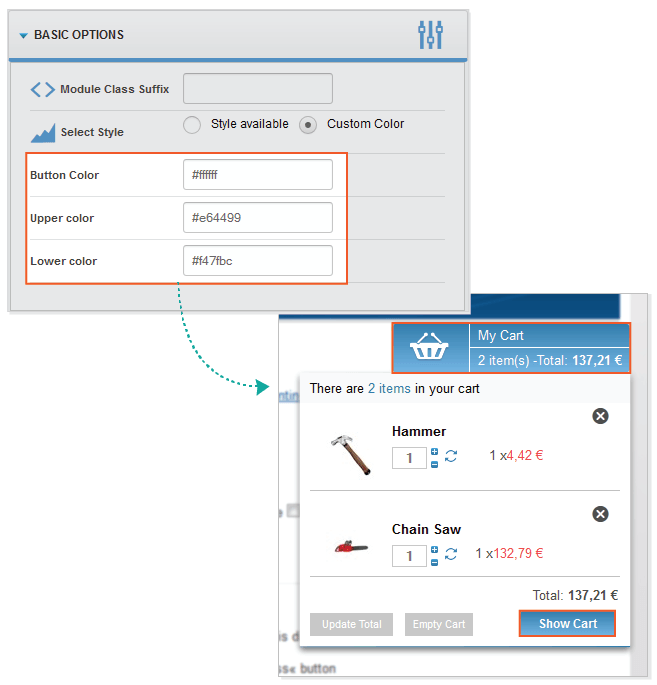 5 colors avaiable ( Blue, Black, Pink, Red, Gray), suitable with many different types of ecommerce businesses, Virtuemart admin can choose colors from admin panel. 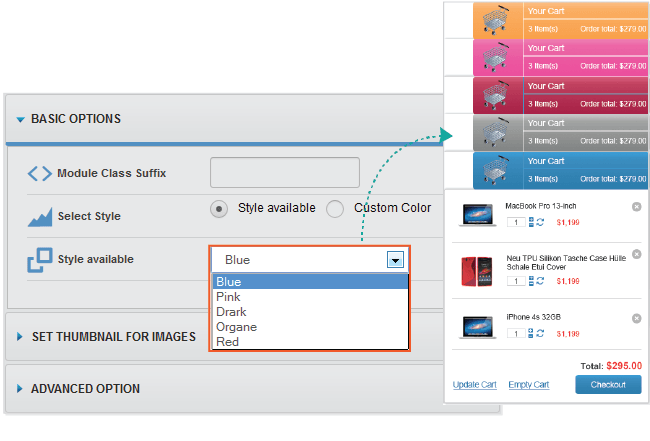 Admintrator can choose colors suitable with your store from admin panel. Config image thumb on cart. Almost well-known e-stores today have the powerful drop down carts swiftly revealing the add-to-cart products in an excellent drop-down list appearance. Ajax Dropdown Cart makes e-commerce websites look tidy as well as competent, giving customer's pleasures when reviewing products that they have chosen in shopping activities. Ajax Dropdown Cart Virtuemart extension is easy for you to set up like a regular Joomla installation. This plugin is very easy to use for your clients. With 3 steps below, customers can work well with your website. Step 1: You go to the website, you will see Ajax dropdown cart. After selecting a product you like with one click on "add to cart" button. 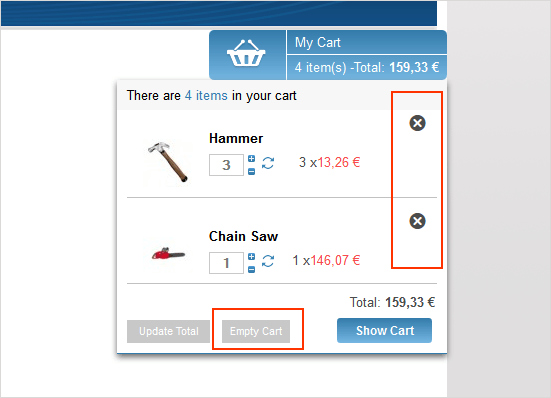 Right now, that product will be added to a dropdown cart, see the change of dropdown cart. Step 2: If you want to check your cart, you need to go to the position of this module then hover or click it; you will see a dropdown cart with all products content includes: image, price, and quantity of products. Step 1: Download the package and install it like a Joomla installation. Step 2: Go to Extensions -> Plugins -> Search "Ajax drop down cart" keyword -> Enable plugin. Step 3: Go to Extensions -> Modules -> Search "Ajax drop down cart" keyword -> Publish module and set up options. If you have any problems during the installation process, don't hesitate to contact our support team, we will have resolved it immediately. 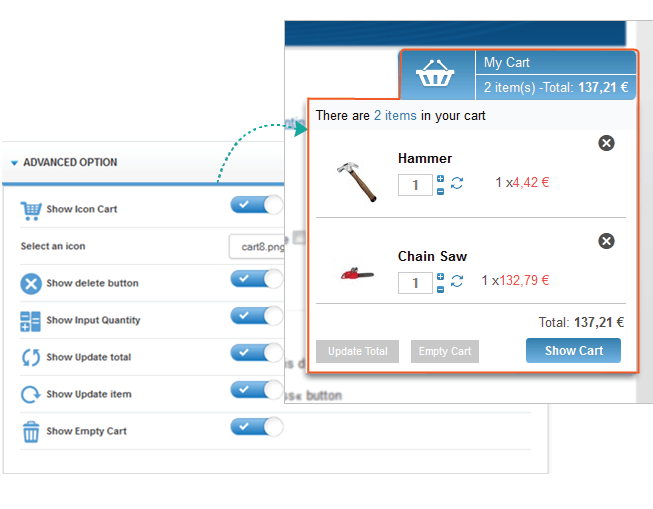 Auto-update: For the dynamic contents like quantity or total price, when they are changed, a customer can get them updated right on the cart without reloading all page. Then, they can keep shopping nearly instantly. Quickly Add to Cart: Customers can add a product to cart just by one click without loading a new cart page and then continue to shop right away. Products Removing: Remove buttons next to every product in the drop-down list allows your clients remove any product without entering a cart page each time. Product Thumbnail: A thumbnail product image in a cart is very helpful for shoppers to remember and compare which products they added to the cart. Various Skins: Admin can freely choose any cart skin that fits different businesses or store's styles. Multiple Languages and Currencies: No need for translation or currencies transformation anymore. We offer everything you need! 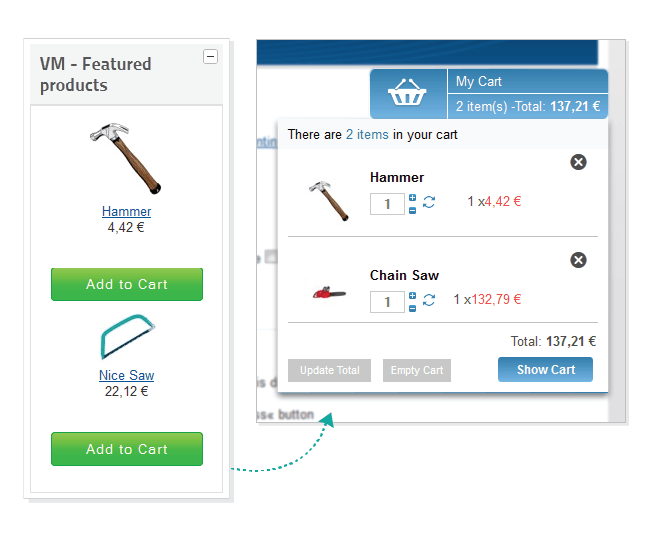 Instantly add products to cart without reloading the cart page: With this extension, your customer can add products to the cart without reloading the page. Ajax load: When your customers update/delete an image to indicate loading process will appear. 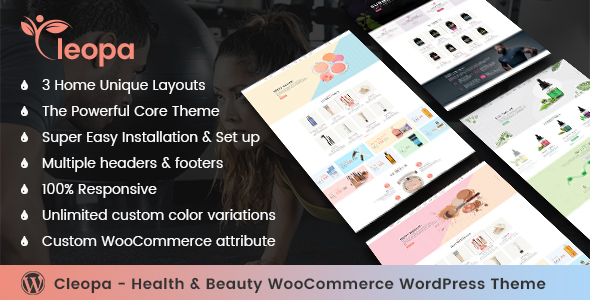 Support multiple skins: 5 colors available (Blue, Black, Pink, Red, Gray), suitable for many different types of e-commerce businesses, Virtuemart admin can choose colors from admin panel. Fantastic product and the support is AMAZING. Quick, helpful, and professional support. Time for refreshing page is reduced significantly and the efficiency increases sharply! Good quality at reasonable price! Highly recommended! Thank you for your excellent support. You have solved all my problems very quickly. I'm sure that you will help me also that the problem again. It is an excellent product , but best of all is the excellent support !!!! I am very happy with the products and with the help offered ! A great product that we should have in his shop, I see the professionalism in products and style of your work. Thank you very much. This extension is useful, my customers can add, remove the desired product without reloading the page. All just 1 click, so wonderful. This extension is useful for my website, customers easily add, remove products quickly that they do not need to reload the page, so to save time for our customers and their shopping more fun out of my store. Thank you very much. If I purchase a license for this product how long will I get updates for it, lifetime or just one year? Currently our license can use forever, we just limit the quantity of the website use, it's means that if you use only 1 Domain License for 01 website. However, we have limit period update version of product for 6 month. Within 6 months from date of purchase, whenever we update new version you can download. But after 6 month if you want to download, you have to purchase this product again or purchase our package service. 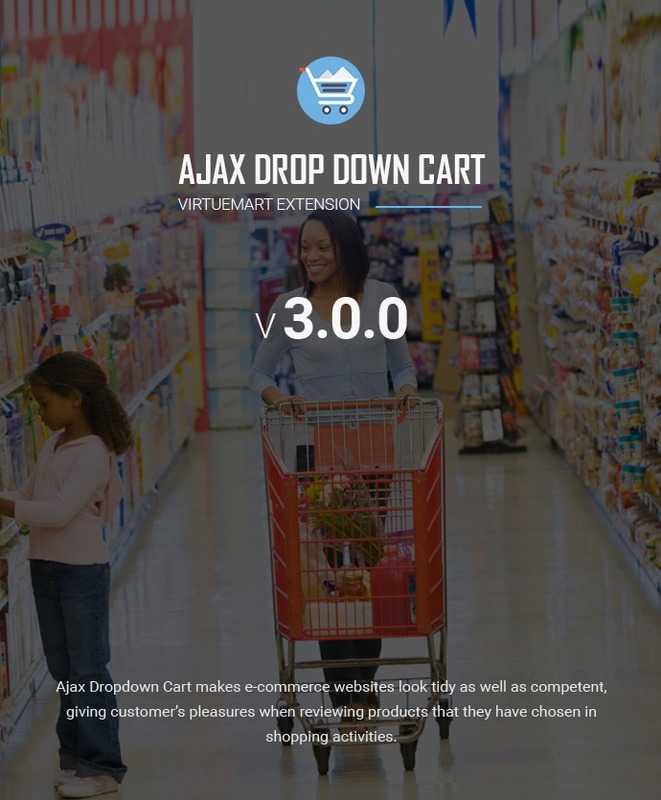 Does the ajax add to cart support the latest Virtuemart version 3.0.10 and joomla 3.4.3? 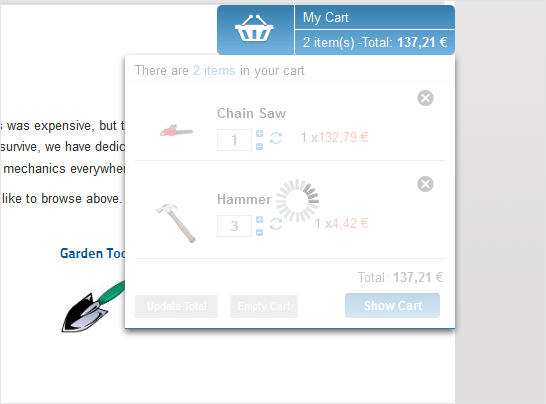 Yes, Ajax Drop Down Cart for Vm support lastest VM version 3.0.10 and Joomla 3.4.3. I cant get the ajax add to cart to work, the image of the product does not appear. the button Update total is not working either ?? Please don’t send your cPanel or server details to netbaseteam@gmail.com because it is spam email. If you sent your information, please change your account immediately. And, we only support via our ticket system. If you have any problems, please create ticket at http://cmsmart.net/your-profile/user_list_ticket. Or We have used email support@cmsmart.net to support our customers. Does ajax add to cart check that the item(s) were successfully added to cart? I have on occasion found the free built in ajax cart function in virtuemart indicates success yet nothing was added to the session cart and the ajax response output indicates failure. We believe this is a server problem but it is solved by adding the item again, and an add to cart function that checks the item is in cart and simply resends the request should solve this. How to change / translate language?